Having a skill could take a lot of practice and practice takes time. Freshman Averi Mickelson had to make a decision of if she wanted to use her time to play golf or not. 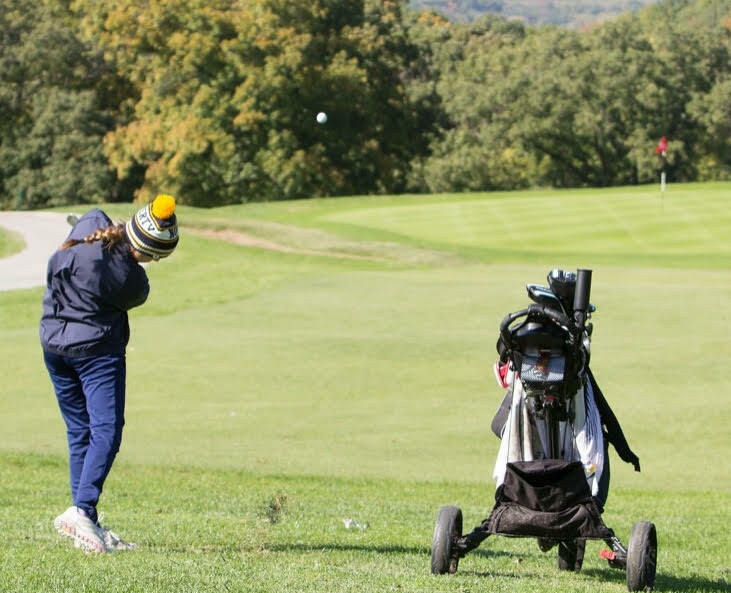 “It was hard to choose between golf and volleyball before the school year started, but now that it is over I am really glad that I played golf. I met so many new people and I got out of a lot of schools, which is great until you have to make up the work. At first, I was really intimidated to be on varsity. There are a lot of upperclassmen on varsity and they all know what is going on. After a while I became really close with the girls and we kind of become like a family,” Mickelson said. There are many strengths, weaknesses, and effects that golf has on Mickelson’s life. “Everyday there are new conditions and your swing isn’t the same so it makes it a challenge every day. It felt really nice to get out of school to do something I love. People were always asking me where I was going and it felt really nice to say I was leaving for golf. Without golf, I wouldn’t have made many of my best friends that live all around the world. In golf, you get to meet so many new people that you would never have met. You also get to travel all around the world and have so many cool experiences,” Mickelson said. Placing in tournaments could be very challenging for some. Mickelson has placed top 12 in all but one tournament she has played in. “I would say she affects the team by getting lower scores and helping us place higher. She also affects the team by showing some of the JV and practice team what it is like to play on varsity golf and what competitive golf looks like. I think Averi played her best towards the end of the season because she knew she had to step it up and be able to make it to state. Also because she won districts, and made it to state,” senior Kyla Wolkey said. Mickelson has many strengths in golf, progressing has helped her to place higher and be able to move onto state. Mickelson placed within the top 30 out of the top 90 girls in the state. “I think she has progressed because of her score the beginning of the season compared to now it has definitely gotten better. She is getting really good scores and winning and medaling in tournaments. This makes it is kind of nerve-wracking playing with Averi, because she is so good and I feel like I have to play my best around her,” freshman Kaitlyn Lafferty said.